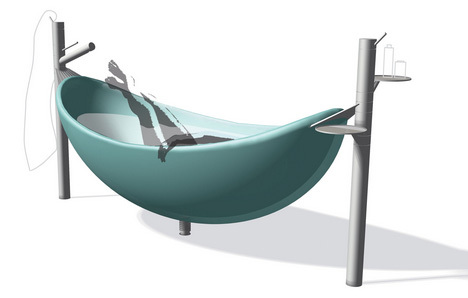 Does your ideal soaking experience involve a classic clawfoot corner-tub design, stark contemporary bathtub or something as informal and relaxing as a hammock? 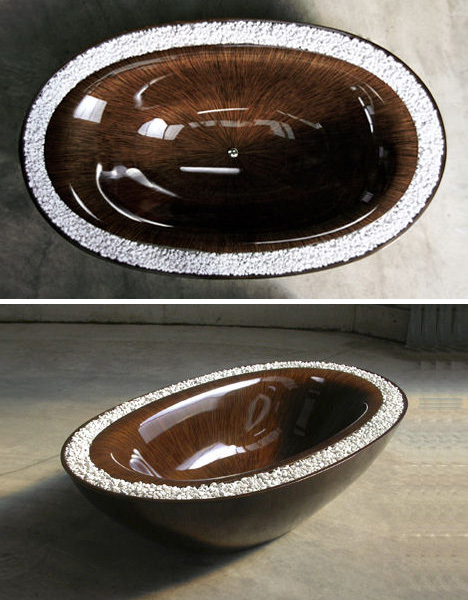 Whether you like the modest natural wood look or prefer the rather flashy (pun half-intended) see-through varieties, there is a luxury bathtub in this collection to fit virtually any bathroom personality and personal taste. Offered by HighTech this elegantly curved wooden tub seems anything but, well, high tech – save maybe the smooth cylindrical metal fixtures that service the stand-alone, naturally-finished basin. Pebbles around the base replace the need for conventional tile. They provide a nice textured and traction-friendly surface for bare feet catch, but equally important: they channel and ultimately drain any overflow (or excess water should the wood turn leaky). 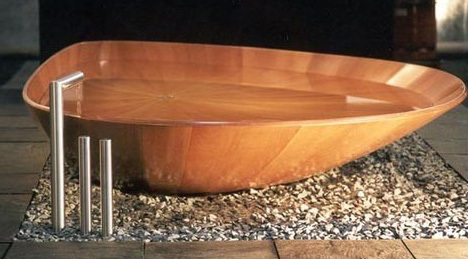 Another integrated wood-and-pebble option offered from Laguna takes things in a slightly different direction, with an emphasis on shiny surfaces, symmetrical curves, built-in chrome fixtures and a highly-contained moat for small rocks right around the upper rim of the tub itself. 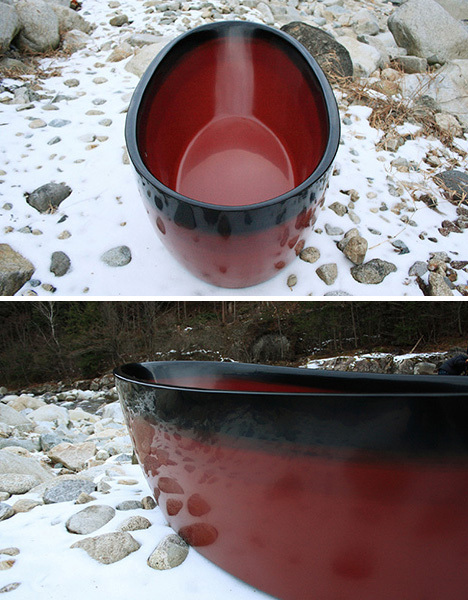 Simple, handmade, lacquered-wood tubs from Ofuro reflect a minimalist-but-craft-oriented attention to detail that aligns with traditional Japanese design approaches. Just how you never damage and have to fix this unique creation -repair on custom-finished wood is not a trivial task. 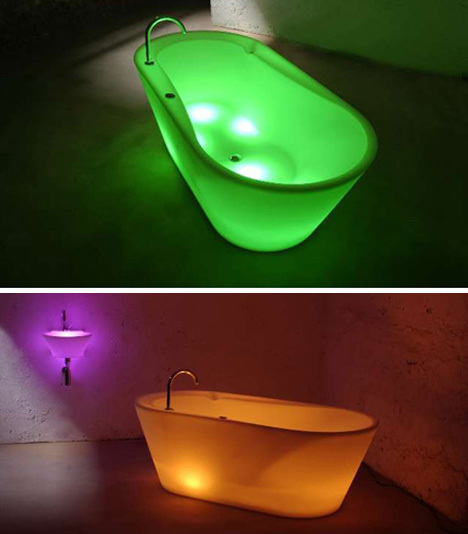 Bright, LED-lit bathtubs designed by Jan Puylaert make a bold statement – and yes, you can adjust the color setting to scroll between green, blue, orange, yellow and other lighting options or set them to a single static color as desired. 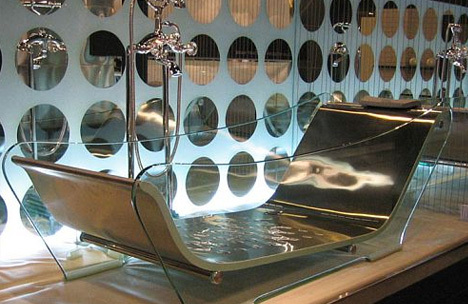 This particular jetted lounging tub from Wasauna is somewhat peculiar, with a combination of transparent plexiglass sides and cushioned seats that make it look as much like a mid-century modern lounge chair as a water-soaking basin. Best of all, a freestanding tub solution like those listed here are easier to install, remodel, repair, reglaze or refinish as needed.